It has been almost a month since Bungie company showed the gameplay trailer, titled Devil’s Lair, and recently it has revealed another Destiny video, which tells us “everything you need to know” about the game. This is exactly how the trailer is called. You will see such studio’s representatives as the community manager - David Dague - and the head of community - Eric Osborne, - who are familiar to you by the previous trailer, and the project’s lead designer - Lars Bakken. Firstly, the new Destiny video demonstrates the audience some of the shooter’s locations, several enemy classes, the facilities of customisation and also the super abilities, which the main characters will get. Secondly, in the new Destiny video the developers explain the key elements of the social features, specifically, in which way the gamers will interact with each other. During the game combats they will face the choice: to join the big group of players and attack the enemies together, to fight against the foe alone or to ignore the battle and continue your game. Let us remind you that the beta test of the upcoming shooter will take place in July. The exact date of it Bungie is going to announce at the studio’s press-conference during E3 2014. But it’s already known that at first this beta test will be available only for PS3 and PS4 users. 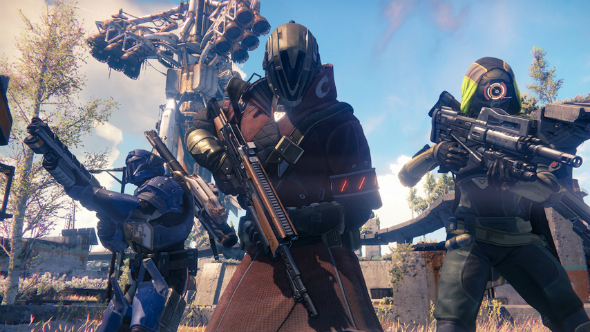 The Destiny launch on the current and next-gen consoles is planned for September 9th. So, did you like this new Destiny video?